Catherine Benincasa was born to a noble family in the Italian town of Siena in 1347; she died just 33 years later in Rome; despite her youth, it is arguable that she was the most influential person in Italy – perhaps in Western Europe – in the years before her death. She gave advice to two popes and expected it to be followed; she instructed warring states to make peace; she preached and counselled many; her followers included Raimondo del Vigne, who became General of the Dominican order, and Stefano di Corrado Maconi, who was later Prior General of the Carthusians; her written teachings on prayer are so significant that Pope John Paul II declared her an official ‘Doctor of the Church’ in 1970. 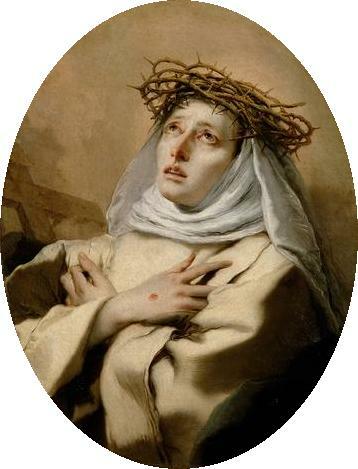 Catherine joined the ‘third order’ of the Dominicans as a teenager, already used to seeing visions of Christ. Members of the third order lived and served in the world, not in a convent, and she devoted herself to tending sick people, particularly those whose illnesses were repulsive to other carers. When the plague arrived in Siena, she and her followers gave themselves incessantly to caring for its victims. She also visited condemned prisoners, seeking their conversion before their death. She became involved in Italian politics, seeking an end to wars between various of the city states and the Papal state. This led her finally to visit Pope Gregory IX in Avignon (where the Popes had at that point lived for several decades), where she miraculously discerned that he had taken a secret vow to return to Rome, and instructed him to fulfil it; he obeyed. She continued to mediate for peace through visits and letters, and finally succeeded in bringing an end to the wars that wracked Italy. After Gregory’s death, the papal schism began, with Urban VI elected pope in Rome and Clement VII elected pope in Avignon; both had supporters amongst the cardinals, and amongst the princes of Europe. Catherine believed the Roman pontiff to be the true heir to the title, and sent many letters to kings and princes instructing them to be obedient to him; at the same time she instructed Urban VI himself to change his behaviour so that he might be worthy of recognition and obedience. Alongside her many letters, her writings include the Dialogue, which contains her teaching on prayer and union with Christ. This has been compared to Dante’s Divine Comedy for the beauty of its language and the profundity of its teaching. She ranks as one of the great medieval Italian stylists, quite apart from the value of this work as a lasting spiritual classic. Catherine’s asceticism was, to modern eyes, astonishingly extreme; even in her own day it was regarded by some of her superiors as excessive. She would go for days without any food, except the sacrament, and without sleep; she whipped herself with an iron chain and wore spikes that pierced her skin. It is difficult not to link her early death to these practices. That said, Catherine stands as one of the most remarkable figures of the medieval church: her combination of spiritual insight and political influence might be matched in the period only by Bernard of Clairvaux. She was a leader of international standing, a powerful preacher, a worker of miracles, and a hugely influential spiritual teacher; that she rose to such heights, and accomplished so much, in a very short life remains astonishing. Background detail on Catherine can be found here.